We have seen that if then a magnetic field configuration of the type shown in Figure 7.7 is unstable to a tearing mode. Let us now investigate how a tearing instability affects the field configuration as it develops. Note that . It follows that magnetic field-lines run along contours of . where is a constant. Here, we have made use of the fact that if the constant- approximation holds good (which is assumed to be the case). Figure 7.8 shows the contours of plotted in - space. It can be seen that the tearing mode gives rise to the formation of a magnetic island centered on the interface, . Magnetic field-lines situated outside the ``separatrix'' are displaced by the tearing mode, but still retain their original topology. 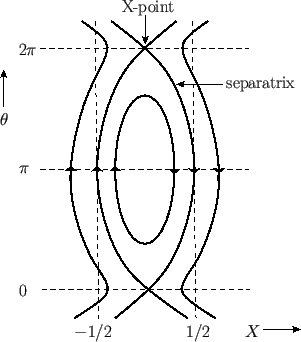 By contrast, field-lines inside the separatrix have been broken and reconnected, and now possess quite different topology. The reconnection obviously takes place at the ``X-points,'' which are located at and , where is an integer. The maximum width of the reconnected region (in -space) is given by the island width, . Note that the island width is proportional to the square root of the perturbed ``radial'' magnetic field at the interface (i.e., ). Figure 7.8: Magnetic field-lines in the vicinity of a magnetic island. The saturated width is a function of the original plasma equilibrium, but is independent of the resistivity. There is no particular reason why should be small. In general, the saturated island width is comparable with the characteristic lengthscale of the magnetic field configuration. We conclude that, although ideal-MHD only breaks down in a narrow region of relative width , centered on the interface, , the reconnection of magnetic field-lines that takes place in this region is capable of significantly modifying the whole magnetic field configuration.